Hotel Spendid, our starting point hotel in South America´s most cosmopolitan city, doesn´t have that splendour to really justify the name. It´s just a...name. When I got here yesterday, I didn´t have expectations bordering on luxury anyway as I know how travel adventure companies like GAP Adventures want its customers to experience. Accommodations tend to be in the center of town, which in fact is, as we are right in the city´s microcentro, close to the so-called "world´s widest avenue", the Avenida 9 de Julio. As always, GAP Adventures utilize local hotels that has charm and character rather than the soulless hotel chains. This in turn allows small local businesses to thrive. 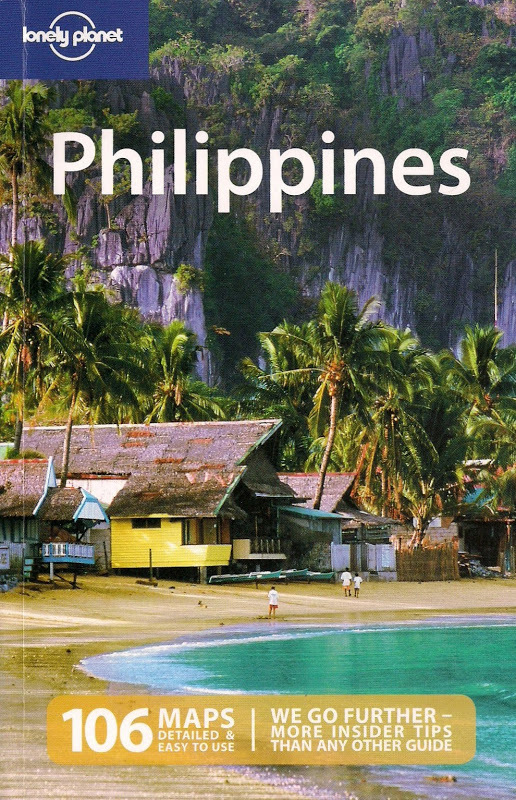 I´m not surprised therefore to find GAP Adventures having been selected by National Geographic Adventure magazine as the top choice for do-it-all adventures in its November 2007 issue. Our tour leader for this trip, Anna Hovlid from Norway, was very proud of this accomplishment. I met her yesterday evening at the hotel during our pre-departure meeting with the rest of the travelers. There´s 13 of us that Anna will be in charge of: 2 from the US (Gary & me), 4 from the UK (Linda, Tom, Chris & Allister), 1 from Canada (Eric) and 6 from Australia (Marnie, Andrew, Johanna, Helen, Jacinta & Kara. As usual, I´m the only Pinoy in this group who lives in the U.S. Like all first meetings, everyone was asking where each one came from, where each has travelled from or will be travelling after this tour. Some, like the Aussie couple Andrew & Marnie (a nurse too! ), has been travelling for almost a year now and this trip with Gap is just a segment of their worldwide travel. Gary from Philadelphia will be my roommate for this journey, a former HIV researcher who did extensive work-related travel in Africa. Anna had the group join a city tour this morning. It was a good introduction to the city, one that´s truly so refined it´s been called the Paris of South America. The buildings, those especially in the microcentro, reek with old-world charm this might be more suited to Europe than to a capital city in South America. 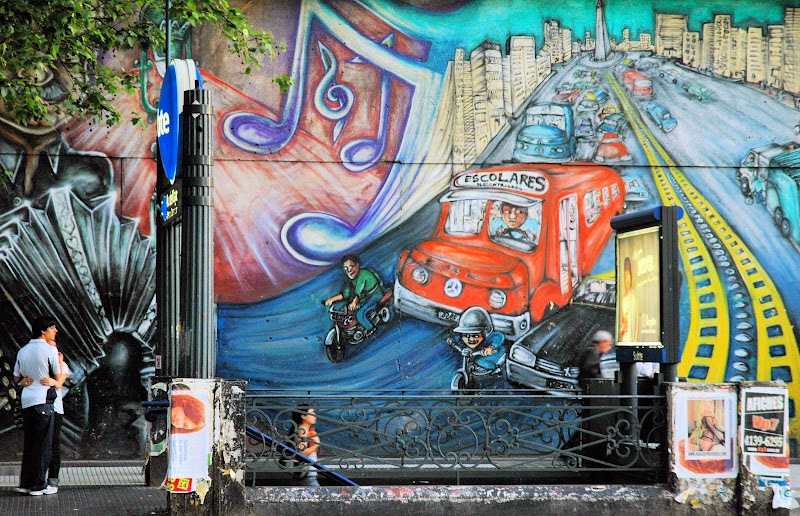 Porteños tend to be your typical mestizo and appears well-dressed in swanky areas like Recoleta and Palermo. Among the sights we saw, I find La Boca neighborhood to be the most colourful literally. It´s here that you find the huge La Bombonera, the home of Boca Juniors, one of Argentina´s most popular football team which had Diego Maradona as one of its former players. The local houses around this football stadium have always been painted in wildly contrasting colors that it´s hard to miss it, so are the pair of tango dancers that appear at the next corner as I walk at a leisurely pace around here. Having done the obligatory sightseeing, Marnie, Andrew, Johanna, my roomate Gary and I, decided to have lunch at the Gallerias Pacifico, Buenos Aires' high-end shopping mall at the end of pedestrian-only Avenida Florida. Argentina is known for its beef so what else would I be eating for lunch but a medium-done steak? I have completely resigned myself to the fact that this is a carnivore country and since they´re good at it, might as well forget about cholesterol for the time being. The steak I had at this restaurant was so good, no wonder the long queue among locals told us that this is a very good restaurant (I forgot the name though). After lunch, I decided to separate from the group as I need to see the Recoleta cemetery. Everyone else in my group has seen this famous dwelling of the dead so I got about two hours to do it before rejoining them for our night flight to Salta. I walked a good thirty minutes, helped as always by a pocket map given to me by a tourism agent at the Gallerias Pacifico. 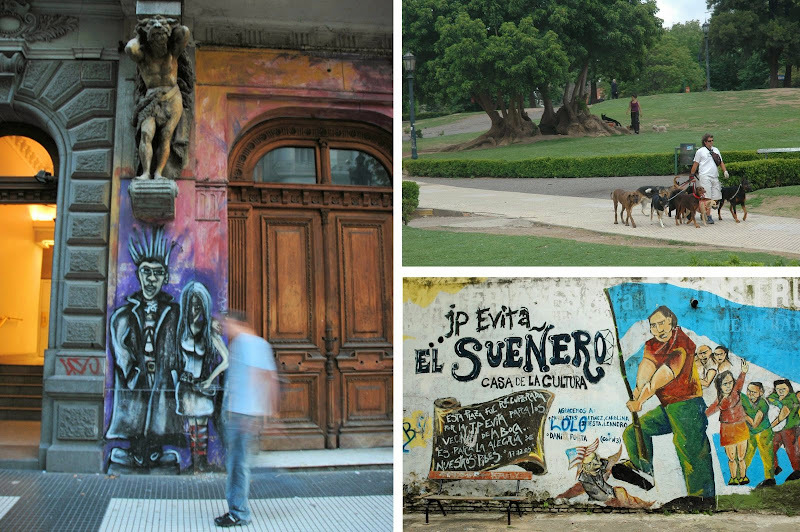 It was a fine stroll into this moneyed area of Recoleta. As soon as I entered the cemetery, I was completely transfixed by the opulence of the first row of mausoleums that met my field of vision. Truly, if the Chinese in Manila has made mansions for their dead, the Porteños have their own lavish way of interring their very famous dead. Recoleta cemetery is designed in a grid-like pattern just like that of city blocks so I was never lost even if I had no map with me. Mausoleums were neatly arranged, some with over-the-top sculptures while others have fallen into disrepair. Interestingly, most of the coffins are actually visible as one peeks inside glass doors. I finally found myself in front of Eva Peron´s grave, without doubt the most famous resident here. Some unknown visitors have offered flowers in her mausoleum´s entrance. Evita, as Eva Peron was fondly called, remains popular long after she died. There was a time her corpse actually went missing when military dictatorship took power in Argentina. For 16 years, the body was secretly buried in Milan, Italy under the name "Maria Maggi". It was later exhumed and flown to Spain where her husband Juan Peron was in exile. Juan's third wife, Isabel, ultimately became instrumental in having Evita's body returned to Argentina. Evita's mausoleum today shows two visible coffins but her body actually rests in another coffin in a compartment down a trapdoor meant to ensure no one will "steal" her remains again. I grabbed a taxi on my way back and decided that I have enough time to pass by a local store to buy some thermal underwear. I walked the length of Avenida Florida and got into the hotel just in time for the trip to the airport. 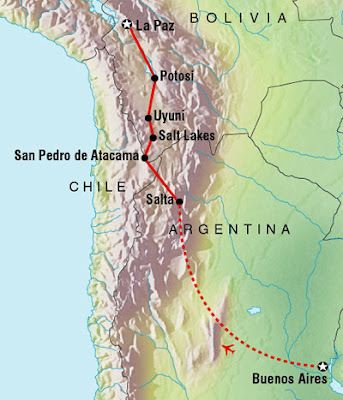 We are flying to Salta up there in the north and what better way of killing the time here at the Jorge Newbery Airport, the airport closest to Buenos Aires (the other being Ezeiza), than to update this blog. Oh I love Buenos Aires! There's so much to do and see. Plus the street art keeps me entertained. So similar with Chile.